Our play reading get-togethers will be continuing for at least a few more weeks. These are informal reads of several plays we’re considering for possible production with The Borderline Theatre Group or the St. Clair Theatre Guild (or both!) in 2019-20. Any interested actor or theatre artist is welcome to come hang out with us and read a scene or two or the whole play, or just listen and give us your thoughts. Starting time is 6:30 p.m. The Borderline is hosting on alternate weeks in Port Huron at The Brass Rail, 410 Huron Ave. Buy your own beverages, sit back and have some fun! The Guild hosts the readings on the other weeks at our building, located in Klecha Little League Park at Goffe and Palmer Streets in the south end of St. Clair. This entry was posted in Community Event, Play Reading and tagged Winter Play Read on April 11, 2019 by Tom Kephart. Two more opportunities to come out and sing with old and new friends are coming up in February and March. Everyone is invited to come out and sing at the St. Clair Library! Tom Kephart will be our performer and song leader on Thursday, March 21, from 6:00 to 7:30 p.m. at the library. The St. Clair Library is located at 310 S. Second St. in St. Clair. Admission is free! This event is co-sponsored by the St. Clair Rotary, the City of St. Clair’s Recreation Department, and the St. Clair branch of the St. Clair County Library System. If you have any questions, use our Contact Form and we’ll get back with you ASAP. This entry was posted in News on February 5, 2019 by Tom Kephart. 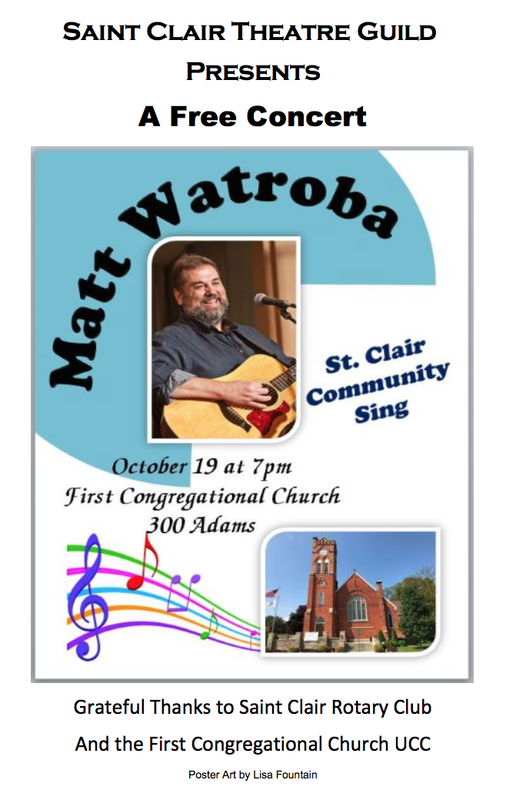 The St. Clair Theatre Guild is pleased to welcome Matt Watroba back to town to lead our next Community Sing! event on Thursday, January 17, from 6:00 to 7:30 p.m. The event will take place at the St. Clair Library, 310 S. Second St. in St. Clair. Admission is free! The event is co-sponsored by the St. Clair Rotary, the City of St. Clair’s Recreation Department, and the library. This entry was posted in Events and tagged community sing, Matt Watroba on December 18, 2018 by Tom Kephart.